You are a great presenter of a mass of information that is often overwhelming for most people. Your ability to provide understanding and insights in relevant and meaningful ways for a varied audience is impressive. I find that I’m overwhelmed with all the balls that I have dropped or forgotten in my life, and there is a challenge with getting those balls back in the air. You helped me recognize the far reaching impact a lack of organization in my financial life can have. You are the epitome of preparedness. I appreciate your support in helping me and my colleagues see what needs to be done and why it does. Your knowledge and compassion serves us well in being more prepared for life’s eventualities. My mother in law told us many times she had paid for her funeral costs. Something we didn’t want to hear but came in handy, sadly, a few years later. Or so we thought…My husband did not get the paid time off but I did so I was left the daunting task of finding out which home she paid this money to. All I found was years of papers that were un-organized. Days later, I found current monthly payments she made that needed to be cancelled. I never did find the paid funeral costs. It would of been so much easier if everything was all together, organized in one place; but how? My husband and I re-wrote our mortgage and needed so many different papers for our mortgage broker. It was a challenge to find things and I consider myself as neat & organized. Luckily our broker was patient and waited while we dug up all the information she needed. Two years ago our 25 year old son passed away unexpectedly and again while grief stricken I was left the daunting task of searching years of papers to close accounts and cancel payments. This time it was very important to me that I get his ID cancelled right away as I didn’t want identity theft. It really got me to thinking…What if I died unexpectedly or fell ill. Who would take care of my dogs? Would they know what I feed them or where there vet was? Would they know they have food allergies? Would they know that I want them to stay together? Would they know what bills to pay and where our banks were? I couldn’t write all this in my will. 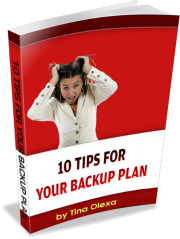 Recently I found ‘Your Back up Plan’ by Tina Olexa. I bought this System right away and put it together. I love it now knowing that any and everything including all my wishes are in my book located in my fire proof safe. If I die or fall ill several people know where my book is and it’s organized for them. It gives me peace of mind! Thanks Tina.